One day while pulling weeds and overgrown vines in my large Florida backyard, I squeezed through the hedges to grab a vine and spied a small frog clinging to a leaf. Instead of jumping down and hopping off to find a calmer location where the plants were not being jostled and shaken, he didn’t budge. For the next hour, I continued pushing past the frog as I pulled on vines and drug them back through the hedges to deposit them in the trash can. But despite the disturbance I was making, the frog didn’t move. Seemingly unfazed by any potential danger, he sat peacefully and unflustered on the side of the leaf. I was surprised at his cool composure. Why was he so calm in the midst of so much chaos around him? With my hands busy with the task of pulling out the vines, my mind was free to ponder things like how a frog could stay so peaceful, and I realized God’s provision of a suit of camouflage made him feel safe. His reaction to danger was to “hide” in God’s provision for him. The frog was able to be quiet and at peace in the midst of the mayhem going on around him, because he knew that while remaining still he’s invisible to predators. He’s camouflaged. He’s hidden. The frog inspired me to think about my own reactions in life, for when uncertainties surround me and life seems chaotic, it’s easy to feel overwhelmed. But when life gets out of hand and we don’t know how to untangle ourselves from the chaos surrounding us, God tells us to “Be still and know that I am God” (Psalm 46:10 ESV) Like a frog that doesn’t move when danger lurks, God asks us to be still. For when we are still, we can find that hiding place in the arms of our loving Father. When we quiet our minds and rest in His care, He can give us His peace that transcends understanding. (Philippians 4:7) In Psalm 32:7, David says, “You are my hiding place, you will protect me from trouble and surround me with songs of deliverance” (NIV) And Psalm 91:4 tells us, “He will cover you with his feathers, and under his wings you will find refuge; his faithfulness will be your shield and rampart“ (NIV). When we’re still and look to God in our troubles, we can recognize that God has the answers for us. He is our security, and He is our refuge. When we look at nature, we see how God protects all His creatures, sometimes by giving a frog the protection of camouflage, sometimes by giving a porcupine prickly spines or a bird the ability to fly away. For each of his creatures, He is a loving creator. But for us, His people, He is also a loving father. God’s amazing love is our protection. He is our hiding place and our refuge. When we’re scurrying around trying to find answers, He stands with His arms out to us, telling us to come to Him. He is faithful and has promised never to leave us or forsake us. He himself is our protection and refuge. When you feel fear stalking you, when your mind swirls around with fears, imaginations, and unanswerable questions, when fear creeps up on you and is about to pull you under, remember you have a hiding place in a God who loves you with an everlasting love. His protective camouflage will hide you from the enemy’s snares. And under the shadow of his wings you can find refuge. About the author: Linda W. Rooks has a ministry of hope for those in broken marriages. 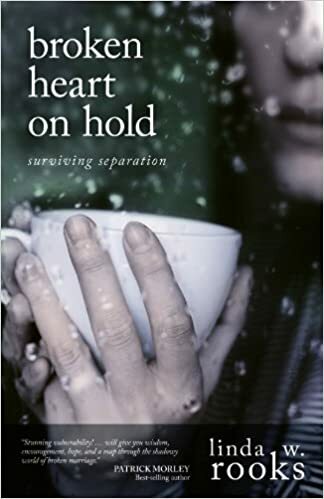 Her book Broken Heart on Hold, Surviving Separation continues to bring strength and healing to those who need an encouraging friend in the midst of marital breakdown. Her new book, Fighting for Your Marriage While Separated, will release in February 2019, to offer practical guidance for those who desire reconciliation. Linda writes for both adults and children, and her stories and articles have appeared in numerous publications including Chicken Soup for the Soul, Focus on the Family and Today’s Christian Woman. She and her husband reside in Central Florida where their ministry to marriages in crisis has helped many couples reconcile their relationships. Join the conversation: When has God been a refuge for you?